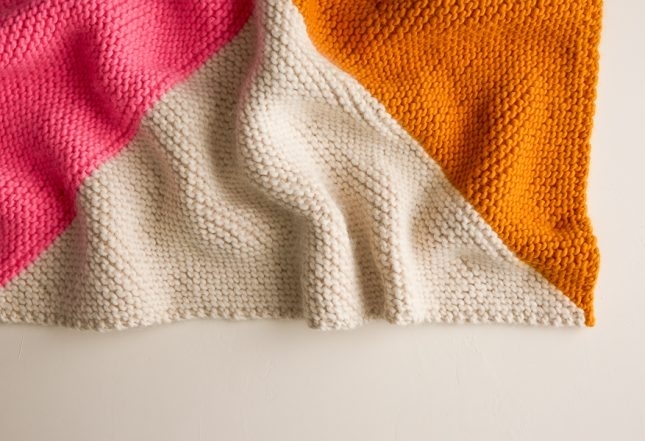 Four converging points, three stitches to the inch, two knitting needles, and one seam, the free pattern for our Four Points Baby Blanket is a math game and a very clever knit! Thick and squishy in our Super Soft Merino, it’s an ideal weight to bundle up baby for a bracing stroller ride or to plop her down for some play time on the floor! Pick an 8-skein Bundle to get started, or try this same blanket in a lighter weight with our Linen Quill version! For more information about this one, please click Product Details, above. SAMPLES: For our samples we used the bundles Fall Dahlia, Dandelion, and Oyster Shell.